Galileo Galilei (1564–1642) first observed Saturn’s rings, but he could not figure out what they were. To him the rings looked like “handles.” He communicated his discovery to other scientists in Europe, and his work would later inspire the Dutch scientist Christiaan Huygens (1629–1695). Using his own telescopes, Huygens found that these handles, which looked like moons on either side of Saturn, were actually parts of a large disk-like ring. 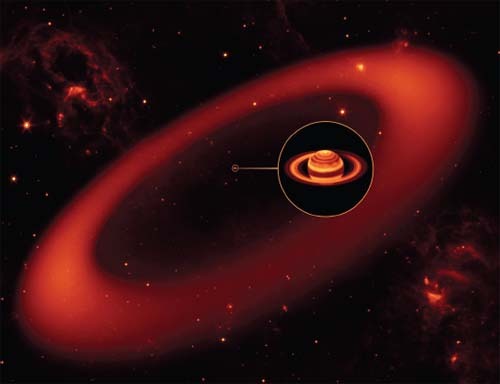 Huygens continued to study Saturn over a long period of time, showing how the changing angle of the planet’s tilt caused the rings’ changing appearance. He predicted that, in the summer of 1671, Saturn’s rings would be inclined in such a way that it would be viewed edge-on from Earth, and would thus disappear from view. His prediction was correct, confirming his ring theory.